It is important that golfers know when to place and when to drop their ball under the Rules, because if a ball is dropped when it should have been placed, or placed when it should have been dropped, and a stroke is made, there is a penalty of two strokes in stroke play, or loss of hole in match play (Decision 20-6/1). However, there is no penalty if the player corrects their mistake before making a stroke. When a Rule permits the lifting of a ball at rest and requires that it must subsequently be replaced at the same spot, it must be marked before it is lifted, so as to ensure the accuracy of its replacement (Rule 20-1). Examples are, lifting a ball from the putting green to clean or align it, lifting a ball to identify it and lifting a ball because it assists or interferes with another player’s play. A Local Rule for ‘Preferred Lies’ may require that a ball has to be marked before lifting, even though it is not going to be replaced at the same spot, so as to provide an accurate reference point for the permitted area in which the ball must be placed (e.g. within the width of a score card, or 6”). In other circumstances, the ball has to be placed where it was before it was moved, e.g. when it was accidentally moved during search for it, or as a result of a practice swing, both of which incur a penalty stroke; or if it was moved whilst moving a movable obstruction, or in the act of measuring, which do not incur any penalty. Note that if it is impossible to determine the spot where a ball should be placed or replaced, such as when another competitor plays the ball thinking that it was theirs, the ball must be dropped (or on the putting green placed) as near as possible to where it was estimated the ball was at rest (Rule 20-3c). If a player has deemed their ball unplayable, or is taking relief from a water hazard, they must drop their ball back into play under penalty of one stroke, unless they are playing under penalty of stroke and distance from the teeing ground, when they may tee their ball. A player must also drop a ball when taking relief, without penalty, from an immovable obstruction, an abnormal ground condition or in taking relief when their ball is embedded in its own pitch-mark in a closely mown area. In any of the examples in this paragraph it is not mandatory for players to mark the position of their ball before lifting it, although I recommended that they do so, especially if they intend taking full advantage of the area of relief, so as to clearly demonstrate to their fellow competitors or opponents that they have dropped within the permitted area. In most cases a ball must be placed on a putting green, not dropped, but there are rare exceptions where this is not the case and the ball has to be dropped. I am not going into detail on these, but for those of you that take an interest in such matters, here are the references; R26-1b, R26-1c, R28b, R28c, R24-2b(ii)(b), R24-3b(ii), R25-1b(ii)b, R25-1(c)(ii). The best way to obtain a better understanding of the Rules? Try testing yourself with a few questions each day; '999 Questions on the Rules of Golf' (updated with the latest amendments to Rules and Decisions). Price: $9.99, £7.79, €8.99 at this link. Barry, my partner had the following happen yesterday and I'm hoping you can help clear up our confusion. He was on the green and marked his ball. Upon replacing his ball it would roll to the left. He tried a couple times and it always rolled but didn't go far. He asked me and I searched the rules book but didn't find the rule 20-3d until the next hole. So, he replaced the ball, it rolled one revolution to the left, he picked up his mark and putted in. 20-3d (i) states he's suppose to place it at the nearest point that it stays at rest. Is he in violation of playing from the wrong spot since he didn't place it in the traditional since but let nature place it for him? Thanks! In my opinion, from your description of the circumstances, no penalty was incurred. The ball was not at rest before it rolled one revolution to the left and therefore this was likely the nearest point to where the ball was marked where it would come to rest. There may have been a slightly closer place to the right of where the ball had been marked, but it would be pedantic to insist that the player should have tried that place before playing their ball. There was obviously no advantage to the player, who had done their best to replace their ball at the correct spot. 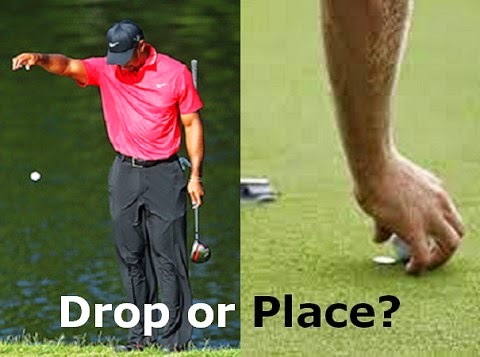 In your explaination on placing or dropping a ball I think that we must consider if the original lie is known or not. If someone hits your ball and the lie is known even if the original lie is altered, you must replace the ball and not drop the ball. Good point. I intend writing a blog on this subject (Rules 20-3b and 3c in the near future.